I originally thought about calling this post something along the lines of, “Sweating My Face Off in a Sunflower Field.” It is indeed a hot and sweaty excursion since the flowers are only in bloom for a couple of weeks during the warmest part of the year, but it’s definitely worth it if you’re in the area and need a nature fix and/or a cheerful pick-me-up. 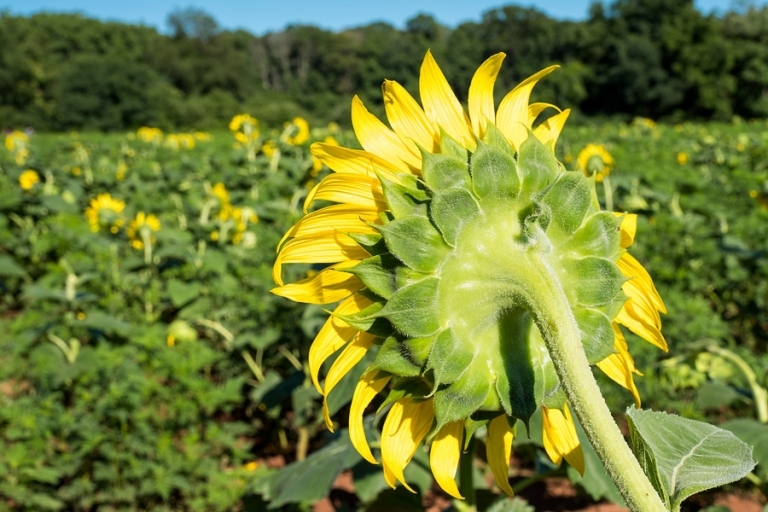 The golden fields of McKee-Beshers Wildlife Management Area are located in Maryland about an hour drive from D.C., tucked into a quiet stretch of farmland countryside. 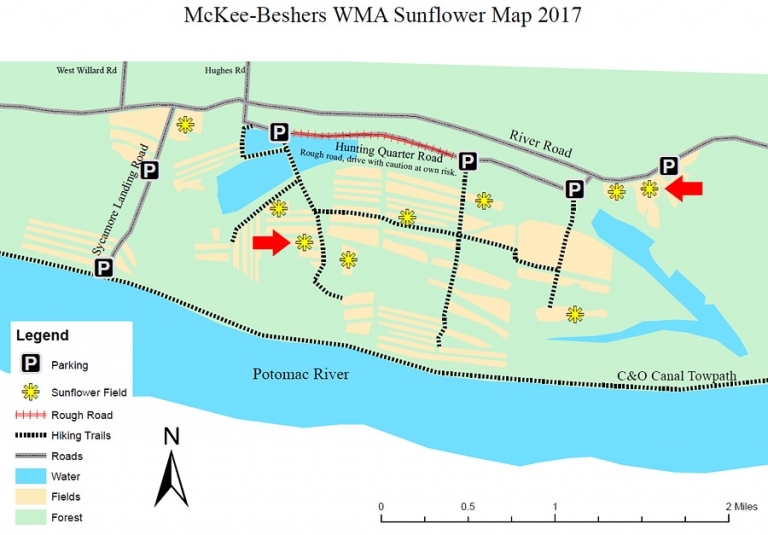 There are a few maps online to make your sunflower search easier, and I found the one on the McKee-Beshers website (shown below) to be accurate and helpful. The area shows up on Google Maps or you can follow the directions posted on the website. 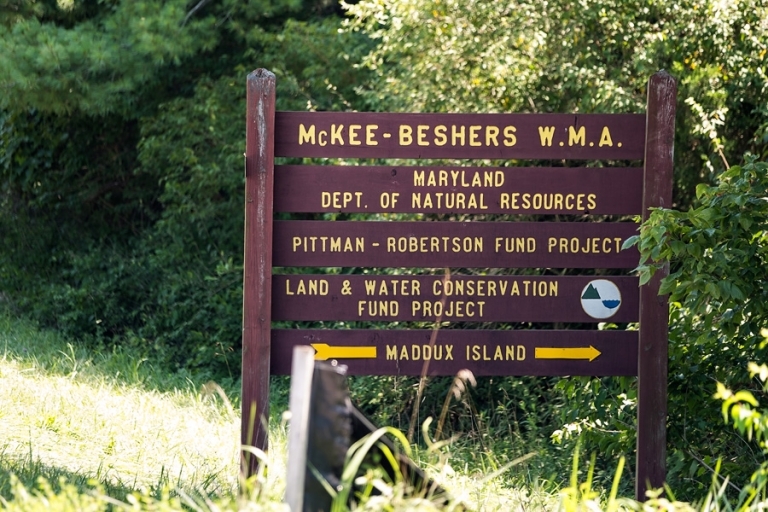 Once you’re close to the location you just drive along River Road until you see the signs for McKee-Beshers (there are a few), and then you can either park along the road or in the small lots if you arrive early/late enough. If you go on the weekend during peak bloom, expect crowds and slim pickings for parking. I ended up going to the fields twice this year. The first visit, Chris and I went in the evening around 5pm to the field directly off of River Road (red arrow on the right below), and the second time I went in the morning to a field further into the park (red arrow on the left below). I had read something online that said sunflowers will rotate throughout the day to face the sun, so I figured it wouldn’t matter what time we arrived as long as the light was nice. Only when we got to the first field, we found the flowers all facing away from the sun! The light was still a little harsh and it was incredibly hot, so we just took a few backlit images, several close-ups, and photos of the backs of the flowers and called it a day. I love these next two gorgeous images, captured by Chris. I went back to the park by myself another time to see if I could also get some photos of the flowers facing the sun. I parked in the small lot along Hunting Quarter Road and followed the trail. After about one half-mile I reached a huge field where the flowers were a little smaller in diameter than they were in the first field, but some were taller than I am! As of July 30th, I think the fields are just a little past peak, but there are still a few that look like they’ll open up soon. I love photographing the flowers in their various stages. I also got to see a goldfinch land on a stem for a few seconds before flitting off to another spot. 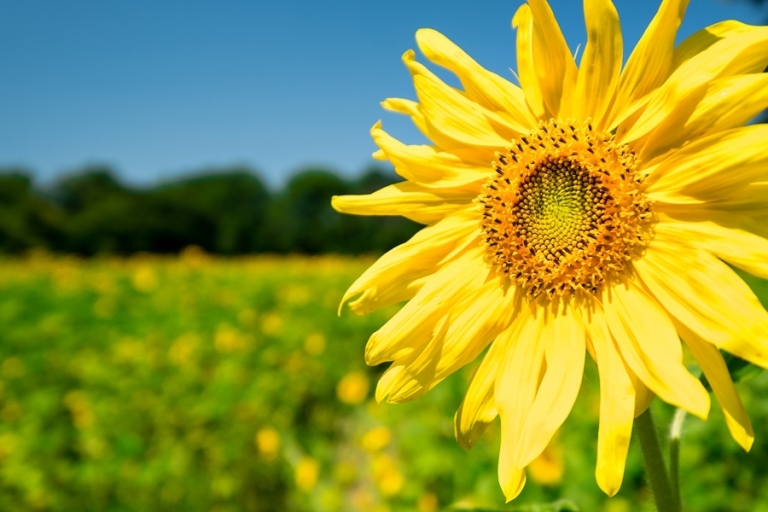 …but mainly you should go for the sunflowers! PRICE: There is no entrance fee and parking is free. TIMING: From a photography perspective and for fewer crowds, I recommend visiting during the hours around sunrise and sunset. I personally would also like to go back on a cloudy day to do some close-ups with the soft, diffused light. There are multiple fields and they are spread out over 30 acres, so if you want to spend time in more than one field, plan to be there for a couple of hours. CLOTHING: If you can stand it, wear long pants! 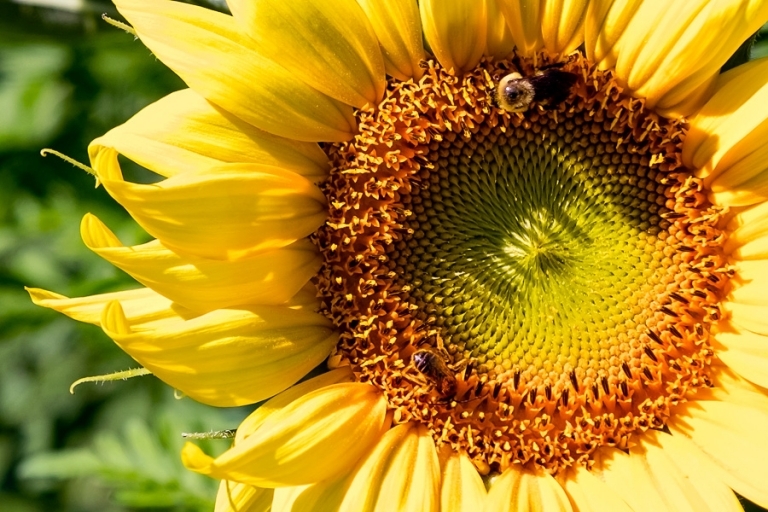 There are paths in among the sunflower stalks where you can walk, but you’ll still end up brushing against the stems and tall grasses, so be aware of the potential for ticks, etc. (I wore jeans so that I could also avoid scratches, but it’s a trade-off since it’s so hot.) I also recommend hiking shoes or boots if you want to go deeper into the fields. SAFETY: Wear a good bug spray. Bring water so you can stay hydrated in the summer sun. PHOTOGRAPHY: We didn’t see any rules or guidance regarding photography equipment and we did see photographers there with tripods, reflectors, etc., so I think it’s safe to assume these pieces of gear are currently allowed. And I don’t know if the flowers ever rotate to face the sun or not, but all of the ones we encountered were facing to the east. I loved using my favorite telephoto lens to get close to the best blooms without having to get too far off the pathways.